Despite the signs imploring people to “Share the Road” on streets and highways nationwide, cars and motorcycles often have a rather discourteous relationship. Riders will tell you that drivers don’t pay enough attention to their surroundings and only truly notice other drivers piloting cars, SUVs, and trucks. On the other side, drivers will report that cyclists ignore speed limits and the suspicion that some riders lack a valid license, an important issue since unlicensed cyclists are more likely to cause an accident. As a San Francisco accident law firm, we see the victims of the tense relationship between cycles and cars. Recently, the California Highway Patrol (CHP”) added a new policy to address a significant issue of debate between drivers and rider, the practice of lane-splitting. According to the San Francisco Chronicle‘s recent report, California is the only state in the U.S. where the practice of lane-splitting is legal. For those not familiar with the term, this is when a motorcycle pilots between cars on a crowded street, allowing the cyclist to travel faster than the automobile traffic. 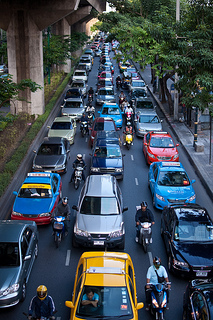 While it may annoy some drivers, lane-splitting has always been legal in the state. However, until now, state authorities never provided guidelines on how motorcycle riders can safely engage in the practice. Sgt. Mark Pope, the California Highway Patrol’s (“CHP”) statewide motorcycle safety coordinator, referred to this as “limited anarchy” and said it was time authorities considered the issue. CHP consulted with other agencies and motorcycle-rider organizations in order to come up with the new guidelines which went into force in January. The CHP’s rule provides that motorcycles should not lane-split when traffic is over 30mph and should travel no more than 10mph faster than the surrounding traffic. The policy applies to city streets, highways, and freeways throughout California. While CHP officers always had the authority to ticket riders going dangerously fast (and still do! ), the new rules provide more specific guidance. Most of the motorcycle riders interviewed by the Chronicle spoke favorably about the new rules. Sgt. Pope, who is also a rider, noted that while some drivers view lane-splitting as “cheating,” it is actually safer for riders than waiting in line. Another rider notes that drivers can see motorcycles in their side mirrors when the rider is on the line, but not when the bike is behind their car in the lane. He said the latter situation leads drivers to mistakenly believe the lane is vacant and move right into the space where the bike is sitting. Pope also added that more accidents result from motorcycles running into the backs of autos than stem from lane-splitting. We learn many lessons in our work as a leading San Francisco personal injury law firm. One major lesson – If a potential client mentions a motorcycle accident, the injuries involved are almost always very serious. This is inherent in the nature of motorcycles and riding, the rider is relatively exposed compared to others on the road and the cycle is smaller than other vehicles so can be harder for an inattentive driver to spot. Motorcycle accidents can involve spinal cord injuries, traumatic brain injury, broken or crushed bones, and even death. These risks make motorcycle safety essential, for both riders themselves and for drivers who must be prepared to share the road.